Sorry for the lack of posts lately. This is always a very busy time of the year for me. I have twelve, full page wrestling illustrations that I have to complete in two weeks time. Then again, busy is a GOOD thing! The above "Lashing Out!" 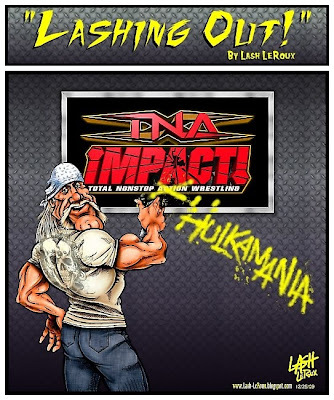 cartoon is my latest for THE WRESTLER/INSIDE WRESTLING. For those of you who follow wrestling, the latest big story is TNA's acquisition of wrestling and cultural icon Hulk Hogan. Speaking of wrestling illustrations, my friend Torren Thomas did a phenomenal painting of TNA wrestler Somoa Joe; which he posted on his blog a few weeks ago. If you're a fan of caricature and/or digital painting you have to check out his site. I can promise you this guy is on the fast track to becoming a Master Caricaturist.